Standee retractable banner stands are great for retail stores in Las Vegas that want on the floor advertising. These graphic displays are perfect where room and space is a consideration for advertising because these retractable banner stands are self standing and come in a multitude of sizes. Instead of mannequins and other old fashion marketing techniques, retailers are choosing banner stands as an option because of their cheap price and versatility. These retractable banner stands are on display. The reason for their popularity is that banner stands are a relatively inexpensive graphic display that when full set up, represents a very large graphic. The most popular version of the banner stand, the 33 inch x 78 inch model has over 17 square feet of printable space on it. Add in the fact that these standee retractable banner stands are self standing ( meaning that no special support is needed and they can be placed anywhere) they can be moved around for that perfect fit in your sign display. Standee retractable banner stands are very inexpensive with the popular 33″ x 78″ stand ( that comes with carrying pouch and adjustable pole stand) costs less than one hundred dollars. These stands are available in the Las Vegas area by many sign stores . Standee retractable banner stands come in many different widths and heights to match your display needs. These stands come in a small two foot side model all the way up to around five feet wide. Since the heights of these stands are adjustable, you can have as little as around 40″ tall all the way up to about 8 feet tall in height. 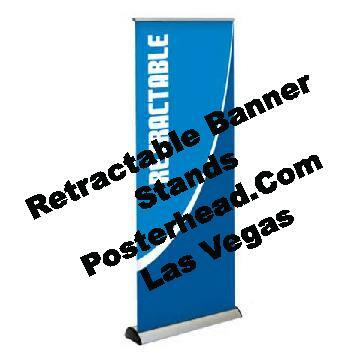 Upright banner stands in Southern Nevada will get you those upright banner stands ( also known as retractable banner stands) for your event. Upright banner stands are growing in popularity because they are very inexpensive, take up little room and can be used over and over again at different events. They come with a carrying case and take a minute or so to set up for display. Upright banners stands in Southern Nevada can be printed and mounted within 24 hours, many times in the same day. This is very important because many people find themselves in need of last minute graphics. Often, the upright banner stands will get damaged while being transported to Las Vegas or if they are being shipped, the shipping company will send them to the wrong location or they simply get lost. That is why many vendors prefer to have there upright banner stands made in Las Vegas and simply either have them dropped off at their event or pick them up themselves. After all, you spent a lot of time and money to get things planned for your event display and you need your graphics for a proper presentation. Upright banner stands in Southern Nevada are made locally in Las Vegas and an be delivered to your event. Many sign shops cater to the events and shows in Las Vegas because there are so many of them. Every casino has floor space available for these events and they attract millions of people to Las Vegas Nevada every year. These banner stands come in many sizes so that you can pick the right size upright banner stand specific to your needs. These banner stands are full color and you can have almost anything imaginable printed on them because of the advancement is modern day large format printers. July 17, 2017 Robert W.
Pull up banner stands Las Vegas 89109 can get you the banner stand in a hurry when you need it. The 89109 zip code is for the Las Vegas corridor that carters to the conventions and trade shows. In fact the biggest trade shows and convention halls are located in that zip code. The Las Vegas Convention Center ( LVCC) and the Sands Expo are located in that part of the city. In addition to the Sands Expo and LVCC, the Westgate Casino and Hotel, Wynn, Palazzo and many other upscale facilities have their smaller event facilities in this zip code. Millions of people come annually to these facilities for the many trade and exhibitions hosted by these venues. Las Vegas is by far the leader in trade shows and conventions. The biggest and the best trade shows happen in Vegas for many reasons. While Las Vegas has state of the art event venues, its also the many amenities that Las Vegas has to offer such as year round golfing, fine dining, top “A” list entertainment, shopping, etc. that causes many industries to want to have their events and shows in Las Vegas. Pull up banner stands Las Vegas 89109 are one of the main display graphics at these events and shows. Space is always a commodity in these exhibition and event booths and you have to maximize the space allocated to you with the proper graphics to reinforce your marketing message. Pull up stands are not very expensive and considered a cheap way to advertise at your event. The pull up stands can be set up by yourself in a minute or 2 and no outside union shop is required to set up your booth. Pull up banner stands Las Vegas 89109 are made and available in the local Las Vegas area at very good pricing. June 29, 2016 Robert W.
Vegas 89119 retractable banner stands allow for portable, easy set up graphics that can be displayed at the Las Vegas trade shows and conventions. Mandalay Bay Casino has one of the biggest convention sites and retractable banners are one of the most popular graphics that you will find. The reason is simple: they are cheap and easy to set up. Vegas 89119 retractable banner stands can be placed next to each other so as to create the illusion of one very large display. The average retractable banner stand comes in many sizes, but the 33″ wide stand seems to be the most popular. By placing 3 of these 33″ wide banner stands together, you have almost 100″ or over 8ft of a solid looking graphic that is very impressive. The upright banner stands are very easy to set up and 3 upright banner stands can be set up in less than 10 minutes. The stands come with a carrying case that allows for easy transportation of the stands if you are flying into Las Vegas. Vegas 89119 retractable banner stands are full color. They can have as many colors as you want on the banners along with pictures and graphics. The banner stands are printed with special inks that are designed to be bright, colorful and long lasting. It only takes a day or two to have a retractable banner stand made for you and in case of a rush, many times they can be made the same day. In Las Vegas, it is quite normal to have to replace graphics that were damaged or lost for a trade show quite quickly so that the show can go on. Contact a local sign shop in the Las Vegas area in case you need one of these retractable banner stands. They would be most happy to assist you in your graphic needs.